During Shabbat on Friday night, Arab terrorists tried to burn down the ancient tomb of the Biblical figure Yosef (Joseph) located in Shechem (Nablus), Samaria, as a "revenge" attack for the lethal arson that killed an Arab infant in nearby Duma village earlier on Friday. While the identity of the culprits in the arson in Duma remains unknown, the IDF has indicated Jewish extremists may have conducted the attack due to Hebrew graffiti at the site, and that indication was apparently enough for the Arab terrorists to launch an attack on Joseph's Tomb. The IDF announced that its forces thwarted an attempt by Arab rioters to set Joseph's Tomb on fire over the course of Friday night. According to the Palestinian Arab Ma'an News Agency, the attacks on Joseph's Tomb started on Friday in the late evening and continued into the early morning. The site reported that dozens of Arab terrorists from the nearby Balata "refugee camp" hurled rocks, empty bottles and firebombs at the IDF forces at the site. Local sources were quoted saying that the Arab terrorists considered the burning of Joseph's Tomb, which they noted is a holy site for Jews, to be a "real response" to the burning of the house in Duma. The attack comes as part of a wave of terror attacks that have been ongoing since the arson, and which were fueled by Hamas calls to attack soldiers and "settlers" as "legitimate targets." Arab terrorists have often hurled rocks at the Tomb in the past, as well as firebombs which threaten the site with arson, as riots have become an all too frequent occurrence. According to the 1993 Oslo Accords, Joseph's Tomb was supposed to remain under full Israeli control. 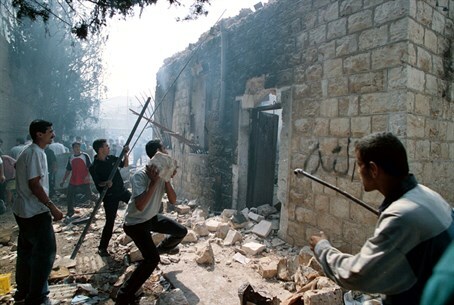 But in 2000 amid the Second Intifada terror war, hoards of rioters invaded the tomb - which housed a synagogue and a yeshiva - ransacked it and burned it to the ground, while parading Jewish holy books and desecrating them. Local Muslims later declared the site as a mosque, as the IDF reduced the Jewish presence to a once-monthly visit. Under previous agreements with Israel, the Palestinian Authority (PA) is required to protect Jewish holy sites under its control, and to allow secure access for Jewish worshippers. However, in 2011 Yosef Livnat was murdered at Kever Yosef by none other than PA policemen as he visited the holy site with fellow yeshiva students. Livnat was the nephew of former Minister Limor Livnat (Likud).